eCommerce market trends in 2017 are driving as quickly forward as the sales they produce. In 2013, eMarketer projected that by the end of 2017 Australia’s eCommerce sales would be an estimated AU $32.6 billion – representing a 21.6% growth in the past four years. With more retailers moving their sales platforms online, the average online Australian shopper is now expected to spend US $4,500 – a significant purchase from any one client. Modern day consumers both expect and require the option for multiple platform use. This could include accessing their favourite sites from mobiles, tablets, and laptops – all of which should be able to accommodate a retailer’s content and simplified point of purchase system. The modern consumer is predominantly visual – they both identify (or not!) with the idealistic lifestyle a brand is promoting and (unfortunately) will survey the usability and aesthetic of your web page to determine the feasibility of finding a solution to their problem within 59 seconds. Cluttered content and misleading taglines? They’re gone. Excellent user experience is a must. Searching and purchasing systems must be streamlined and simple – these results in success rate of converting a browser to a consumer. Does it take too long for a product to load into the purchaser’s cart? Gone again. The consumers of 2017 are highly distracted. It’s not our fault – one marketing research firm estimated that we are inundated with up to 5000 messages per day. The best strategy for cutting through the clutter? Keep it simple. For customers to recognise that your product or service will be the solution to their problem, they need to know exactly what you offer, immediately. Cut away the superfluous text and misleading imagery to streamline your platforms to represent exactly the solution you offer. Key Features: Organized by product category, and then by style and colour, Arro Home makes accessing and browsing their website (which includes hundreds of product images) incredibly easy – allowing users to find exactly what they’re looking for and make that purchase. Key Features: Elk’s website keeps it modern and simple – much like their product line. Users are invited to search for stockists, buy Gift Vouchers, and Login to their purchasing accounts directly from the site’s landing page. Your Shopping Cart quantity is tracked and purchase total tallied. Key Features: Representative of their name, Simple Form’s eCommerce design is clean, clear, and uncluttered. As an art retailer, SF often posts a photo of a photo – a tactic that shows clients how to style their spaces using SF products therefore, their web page is an extension of the same. Key Features: Jumping on the bandwagon of the newly popular ‘ZipPay’, Design Stuff clearly and simply directs customers to Sign In to their purchasing accounts, search for specific products, and keep track of items added to their carts. ZipPay, a simple and secure way for shoppers to buy now and pay later, is highlighted as a key feature to help convert Design Stuff’s potential online buyers. 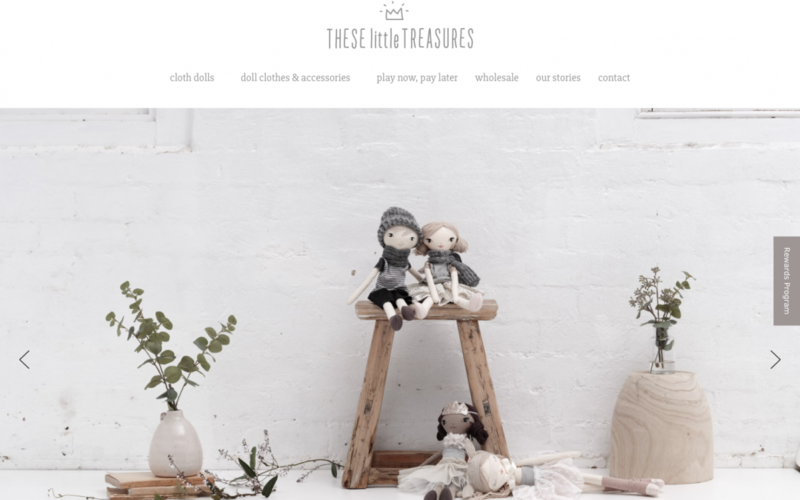 Key Features: Immediately displaying their handcrafted product selection, the These Little Treasures online store is designed to accommodate buyers from desktops, mobiles, and tablet devices. Design features not only include products for purchase, shopper payment methods, but the story behind the brand (an important feature for developing a lifestyle connection with your consumer), and a rewards program – a free bonus available for would-be buyers. Key Features: Targeting the health conscious, working professional, Aussielent beats buyers to see themselves as part of the brand by opening their web page with an image of their ideal consumer. The business is targeting time-poor professional male customers who have limited time to cook healthy for themselves. As a result, Aussielent preemptively imagines a consumer’s ideal lifestyle with the consumption of their products. Have you been considering rebranding your product or service to take advantage of these eCommerce design trends? Or perhaps you’re running a startup looking to attract and convert your ideal customers? From brand to website design, the right agency can help you identify your best potential clients and develop the words and images that will entice them. Ready to build your perfect eCommerce platform? Detail your projects thoughts and ideas on this Google Form and we can provide you with an obligation free quote about the services we can offer tailored for your company and your brand. We look forward to hearing from you!